Designed for durability, Neudorfer Steel Parsons Tables are suited to working environments like libraries, meeting rooms, classrooms, dining rooms, and laboratories. Large table assemblies are available with this system, as are occasional tables—making it possible to obtain all tables for an installation with one specification. Steel Parsons Tables offer the flexibility to accommodate many needs and budgets. Tables may be outfitted with power, lighting, and wire management as desired, and other options are available to customize tables for specific needs. Choose wood, plastic laminate, or NeuCast© Acrylic surfaces. Laboratory grade tops are also available. Standard, counter height, café height, occasional height, and custom heights are all available. 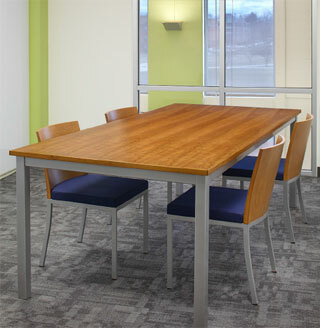 Standard height tables feature a vertical clearance of 27 inches. Bases may be finished in any of our powder coat colors. Levelers are standard. Casters may be specified at one or both ends. Stretchers are recommended for all tables above standard height—and for extra rigidity wherever needed.